February 14 or also known as Valentine Day is just right around the corner and you know what that means – everyone is trying to find the perfect “gift” for their love ones. There are many ways to show your love this Valentine’s Day, but the reality is there are few gifts that ever have a lasting memory. 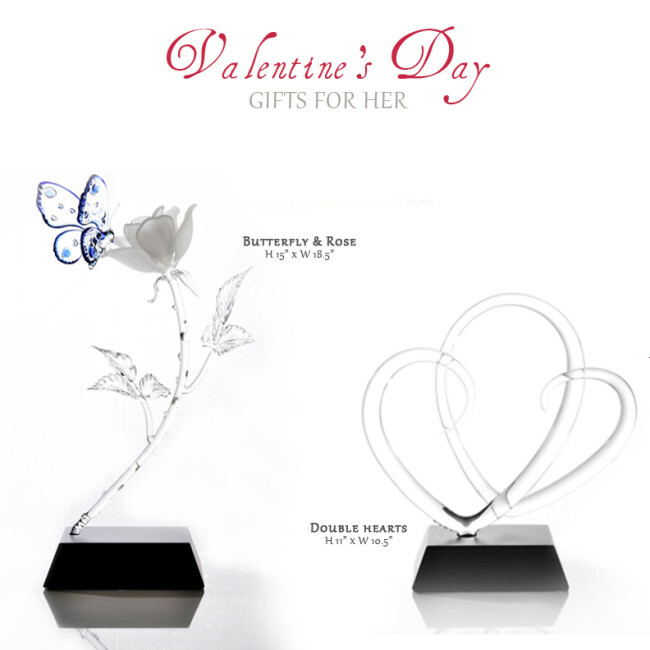 This year, why not make your display of love a gift that not only shows how much you care, but also something with meanings. Whether you want to buy an extravagant gift or something small but significant for your romantic interest or your mom and grandmother – you can be sure to find one at MC Glass Art Gallery. Shipping Details: The minimum purchase amount for each Shipping Offer is $200 or more. Gift wrap is included at no additional charge. Offer applies to Standard Shipping to one location in the United States only and may be applied to Premium or Overnight Shipping for an upgrade fee. Flat-Fee shipping applies only to . Free Shipping applies only to continental U.S excluding Alaska and Hawaii (please call us for shipping details to Alaska and Hawaii). Internationally shipping do not qualify for Free Shipping. Please call us for details if you wishes to ship internationally. We apologize for any inconvenience this may cause. This offer expires on February 9th 2014.